We all know that it’s not very British to talk about how great you are, but in the world of PR, blowing your own trumpet is a sure fire way to get some attention. Often, brands can be guilty of limiting the ‘news’ they share to that related to organisational updates, new developments or campaign work. What’s really important, and extremely newsworthy, is to talk about your own success. A great way to do that is to enter your brand for industry and business awards which happen throughout the year and to promote your success throughout this process. Almost every industry you can think of will have their own sector awards. From the Retail Industry Awards to the UK IT Industry Awards, there will be something to fit your world of work, not to mention generic business awards and regional awards. Not only is this a great way to showcase your good work, it also engages staff and motivates them by showing them how proud you are of their success. When you look internally at work that may be suitable for specific award categories, you’ll often amaze yourself at the performance of your business and how you compare amongst your peers. Answer the question – Judges are inundated with entries and those that stand out are those that are clear, to the point and answering the questions they have been asked. Give solid evidence – Detail real examples of things you have done that show how you meet the criteria. Tell the story – Strong entries will show a before, during and after in relation to a project, a person or an innovation. What was the situation before, what did you do, and crucially, what were the results? Use supporting evidence – Many awards will allow you to include supporting evidence – think outside of the box with this. Use images and reports but also think about getting some great testimonials from your clients, customers or partners or put together a short film. Check your spelling – nothing annoys judges more that reading entries that are full of spelling mistakes or grammatical errors. Check, check and check again! Then…when you’re shortlisted, tell the world! It doesn’t matter if you don’t win, being shortlisted or even being nominated is newsworthy on its own. If you do win – sing your own praises from the rooftops! Publish it on your website, share it on social media, and send news releases to your industry and regional titles. We’re experts in researching and writing winning award entries, in fact, we’ve successfully entered clients for 50 awards this year and have secured shortlisting for 27, with further announcements to be made soon. 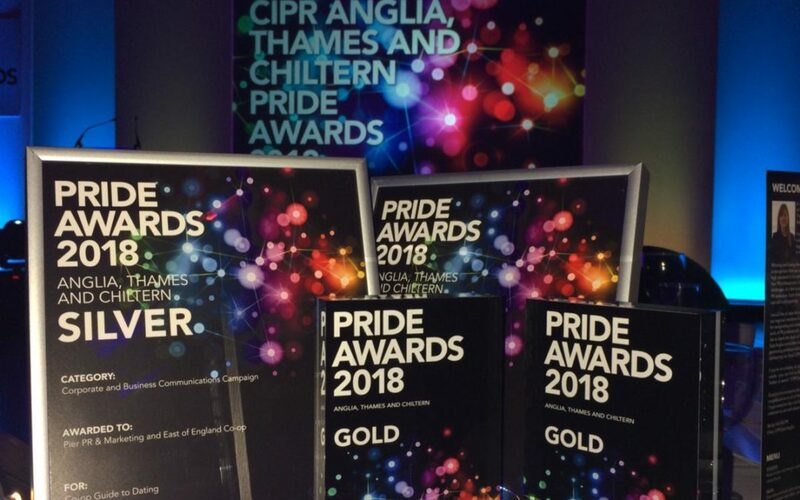 In addition, we’re great at celebrating our own success and were shortlisted for 10 awards in the 2018 CIPR (Chartered Institute of Public Relations) East Anglia PRide Awards 2018; receiving more nominations than any other organisation in the region. Have a go, get creative and tell the world how great you are. If you need any help, get in touch.